​The Para Clamp is a re-engineered Versa Clamp that works only on parapets. Simply place the clamp over a parapet and slide the compression plate against the surface. Turn the compression rod against the plate, and you are finished. 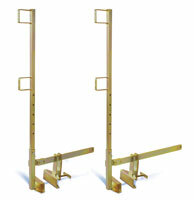 The Para Clamp can be purchased to fit up to 19-inch-wide or 25-inch-wide parapets.